Only ONE MORE DAY! until the Match Madness Writing Contest opens! I cannot wait to read the fabulous entries I hope will soon be pouring in to distract us from the fact that it is still 10 degrees even though tomorrow is the official first day of spring! One quick note on the contest: apparently the definition of "fairy tale" is a knotty one, not, as I thought, clearly the Snow White, Cinderella, Little Red Riding Hood, Goldilocks, Sleeping Beauty, Ugly Duckling, Rapunzel, Rumplestiltskin etc. type of story. So many people have argued their cases for nursery rhymes, fables, etc. and I don't want to have to disqualify anyone over a difference in the definition of fairy tale, because different definitions do appear online, so whatever you guys have written is fine. Apparently the rules were not clear enough, so my fellow judges and I will figure it out :) But, I do hold the line on art notes. Even if your story is intended to be a picture book, no art notes because we get into a weird area with word count. And in answer to someone's question, your title doesn't count in the word count. I think Something Chocolate might fuel the creative muse. Let's have some of Teresa's French Chocolate Silk Pie, shall we? 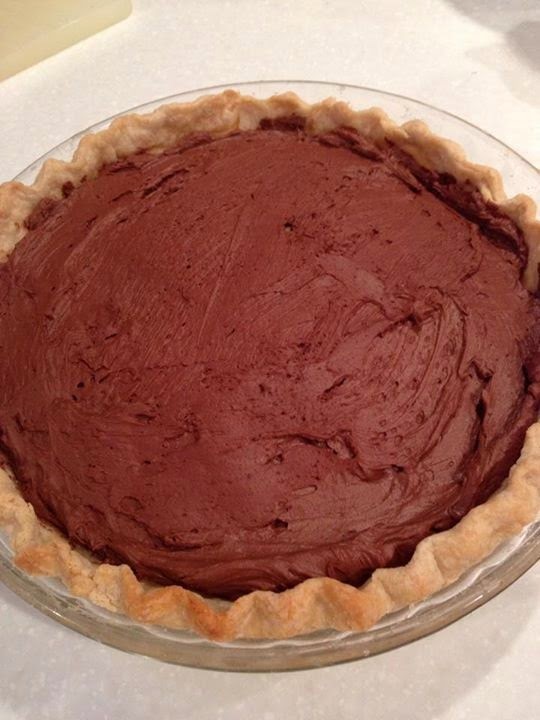 Teresa's French Chocolate Silk Pie - gorgeous, isn't it? And here's a tasty view of a delicious slice - YUM! But now let's get down to brass tacks! Sophia wants to win the school science fair, but when her project won’t cooperate, she uses perseverance and teamwork to bring home the goal, proving that every girl can be a STEM girl. The giant Mini wants to continue her school’s tradition of putting on the annual production of Klurg and the Beanstalk. But during practice, Mini’s co-star makes jokes and goes off-script, and Mini fears he will ruin the show. It is only when Mini makes her own blunder on opening night that she realizes the value of creativity and flexibility, and works with her co-star to make the show a success. Herman wishes he was like everyone else, but when all the other kids are gazing at their belly buttons during gym class, Herman is hiding his coil shaped tummy under his t-shirt. When just another day at school turns into a daring rescue mission, Herman becomes an unlikely hero when his flexibility saves the day. Tilly's dreams of having a baby come true when a hatching egg presents her with a fluffy bundle of … crocodile! Everything is bliss until Charlie starts to grow. AND grow. When her friends start disappearing, Tilly worries that she’s next on the menu. But when Charlie invites her down to his cave, she’s in for a big surprise … party! Please vote in the poll below by Friday March 21 at 11:59PM ET for the one you feel most deserves a read by editor Erin Molta. Today's pitch comes to us from Beth H. who says she is a, "Chocaholic, reformed Catholic, (I don't feel guilty anymore about eating chocolate), red wine lover - (no I was not an altar girl) seeking to publish children's books that introduce children to self love, thinking out of the box and just plain silliness." The Pitch: In a quest to build the perfect web, an obsessive compulsive spider confronts his biggest fears through an unlikely friendship with an inquisitive dragon. In a wild ride on the dragon's tail, Martin learns how to relax and enjoy the simple process of creating - leaving a beautiful web behind him to his utter disbelief. Please send YOUR pitches for the coming weeks! For rules and where to submit, click on this link Would You Read It or on the Would You Read It tab in the bar above. There are openings in July so you've got a little time to polish up your pitches and send yours for your chance to be read by editor Erin Molta! Beth is looking forward to your thoughts on her pitch! I am looking forward to the contest! The March Madness Writing Contest!! Which starts tomorrow!!! I'm so excited!!!! Oh, wait. I'm having deja vu. Did I already say that??? Never mind. It's still true. Start counting the hours!!! I have my entry done - just tweaking it a bit! Are Nursery Rhymes (like Humpty Dumpty, Mary Had A Little Lamb, etc.) okay or not? Yes! I'd read the book! I love the pitch! This sounds great, and I love the message! I voted for a pitch! Thanks for voting, Erik, and for your comments for Ms. Halleran! About the contest... eek... nursery rhymes are not fairy tales, so technically no. But I sense there is going to be a great deal of confusion over this, even though the rules said fairy tale. I've already had other people ask about fables and such... So I guess I'll have to see what comes in and figure it out from there. Yes, I would read it. Loved the pitch, although I'm not sure you need the phrase "leaving a beautiful web . . ." You might consider ending the pitch at "creating." I voted but it was rather hard. Each entry was uniquely enjoyable in its own way. I would read today's WYRI, mostly because i love dragons lol!! Voted! Those are a nice bunch of stories to choose from. As for today's pitch, yes! I would read it. Sounds hilarious and is written up very well. I can't think of a single thing that I'd change about it (that's pretty unusual for me). Good luck to Beth! I think the pitch is interesting--contrasting characters, introvert vs. extrovert. Be careful with the term "obsessive compulsive" since to some it is a serious condition although many use it in an off-hand way. You could substitute "fussy" or "uptight". I like the pitch, and yes, I would read it. I agree with Jenn about the term "obsessive compulsive," and also wondered about the last line. It worked for me, but something about the "utter disbelief" stopped me. Good luck! Thanks for your thoughtful comments for Beth, Pam! Nice suggestions, Jenn - thank you so much for sharing your thoughts for Beth! Yes, yes I am :) Thank you for the pie. It was virtually delicious :) And thanks for your enthusiastic comments for Beth - I'm sure she'll be pleased. As for the sample... I don't know... I may not be able to pull it out of the hat this time...! Thank you so much for sharing your perspective for Beth, Pat! I'm sure it will be very helpful! Yes, I would read it. I think that for children suffering from OCD would be able to identify with the spider. It has potential to help them. First, I want to eat that pie. And I'm thinking I'll lap up your story, too, because I suspect it will be yummy. And finally, I would read this spider story because I like the idea of such a misfit friendship (though I hope it's not too preachy!). Also, I like the idea of a spider who's a perfectionist but not so much OCD. So I'd use the word "fussy" or "persnickety." And I'd leave off the "utter disbelief" bit. That's it, and good luck, Beth! YES--A spider with OCD, oh my goodness I want to read more! Though it might be a little over the heads of kids without OCD, it would be a great story for kids with OCD to identify with. I think parents reading it to their kids would also get a chuckle out of the story line. Thanks for the pie Susanna, chocolate's the only kind of pie I really like! Place my vote for the February Pitch Pick, wonder which one will win?!? Yes, I'd read this cute PB. Love the spider/ dragon dynamic. That slice of chocolate heaven and seeing "my first robin" outside the window this morning (on the only patch of ground not still covered by snow) put me in a great mood to read Beth's pitch. Beth, I love your contrasting characters of a tiny spider and the big tail-swishing dragon! A suggested revision for the pitch wording would be to change "the simple process of creating" to "the simple pleasure of creating without any fear", as we all know that creating is often anything but simple (Susanna- how's that fractured fairy tale coming along??? ), but is usually fun! thank you Charlotte - I"ve been thinking about that very thing - I felt that the simple process of creating was too broad. Thanks. Wow - never thought about the niche market - was thinking in more broader market terms - but Thank -you so much! Thank You Rene. Great to hear. Pam - I just read Jenn's comments also - I did have some reservations about using it - and will reword this - you guys are lifesavers! Jenn - thank you so much for your thoughts. I will absolutely rework the obsessive compulsive reference. Many thanks! Hi Pathaap, you know - I did leave off the last phrase on one of my versions and left it at "creating" - but then I thought I needed to tell the rest of the story as we are advised by so many experts. Thanks. Hi Susanna, jumping into the discussion with you and Erik because I have the same questions about fairy tales. I actually have mine written, but now I'm not sure it will qualify. So I took the liberty of doing a little on line research, and alas I found differing opinions. I will link them here so you can take a look and let us know which one you're going to use as your definition of fairy tale. The first subdivides fairy tales, folk tales, legends and myths. And the second, wikipedia, lumps them all together with anything magical having a happy ending. Wow, that chocolate pie looks awesome, and, yes, I like the spidery PB pitch. It would definitely grab my attention, and I'd want to read more. Yes. I have also read this wonderful story. I absolutely love it! I seriously had no idea the concept of fairy tale would be so open to debate. If there is this much confusion, I'll just take whatever people send. To me, a fairy tale is the classic Sleeping Beauty, Ugly Duckling, Elves And The Shoemaker, etc... Fables have morals. Legends, tall tales, myths and nursery rhymes are all slightly different hence their different names. But I realize at this point people have mostly done their writing, so whatever shows up is fine. I voted and had chocolate! I would read! Sounds cute! Thank you for sharing your thoughts for Beth, Kimberly, and so glad you enjoyed the pie. You can thank Teresa - she baked it :) Thanks for voting... ah the suspense til we see who wins...!!! Yeah... no pressure... no pressure at all... it's just my own contest... ACK!!! Thanks for voting - I know it was a very tough choice! Thanks so much for chiming in for Beth, Rene! I would definitely read this story! I suggest using the word "perfectionist" rather than OCD because I think it would apply to many more kids than those who are just diagnosed. There are a ton of kids out there without OCD that struggle with wanting their work to always be perfect. I also wonder if the second sentence gives away too much of the ending? I didn't feel like I was left in suspense and I think you'd want agents/editors to feel that way so that they would want to read the book. Voted. Chocked. Would read the picture book indeed but agree with Cathy that maybe fussy might be better than OCD! I also had no idea fairy tale could be interpreted so broadly. You live and learn! Such good pitches! I voted, but it wasn't an easy choice. Beth, the pitch is great: clear and catchy. I love the pairing, and Martin reminds me a bit of Scaredy Squirrel. Like others, it's mainly wording for me: perfectionist, simple pleasure. I may look at re-wording the very end--not because of the cliffhanger/full disclosure debate (I've heard both sides from agents). The end phrase sounds almost there; but even without "utter disbelief," it may need another go. Good luck with fracturing your fairy tale, Susanna! Go weird! Great pitches, it was hard to select. Yes, I like today's pitch. It sounds like a romping story about letting go. Agree with the others about using OCD in the pitch, although it could be mentioned in the query if it necessary. Like fussy, picky etc. Yes, I would read it! I like the idea of dealing with OCDC behavior in a light-hearted way. Sounds like a niche that needs filling. Plus, I love the huge difference in size between a spider and a dragon. Hi Beth. Lovely idea. I agree with the OCD comments below and feel strongly about cutting "to his utter disbelief." If you did cut it, then the pitch would end with a positive statement rather than a (slightly) negative one. Good luck with it. Thank you Steve - I appreciate your coming on to comment. It's been a big help! Hope you are well. Yes I would read it. You have some great comments already, so I won't add. Love that he takes a ride on a dragons tail. thanks Julie - glad you would read it! I love a spider-meets-dragon story with a happy ending, so yes. I would read it. I agree with the suggested "fussy" or "perfectionist" in place of OCD. Good luck with it. My mind paused when the tail was identified as how he romped, it narrowed my many ideas from romp, swing, dangle and slip from the dragon's claws, jaws and wings to just the tail. I also paused on 'utter disbelief'. I didn't have a problem with using obsessive compulsive, the two words summed up a really cool and interesting character who experiences a lot of trouble along the way. e.g. In a quest to build the perfect web, an obsessive compulsive spider confronts his biggest fears through an unlikely friendship with an inquisitive dragon. In a wild ride on 'dragon, Martin learns to let go and create his most perfect web yet'. Since I am your critique partner, I'm 4000% biased, but of course I'd read it! You have such a wonderful imagination Beth, and it is always so much fun to see the completely original stories you create! And thanks for the yummy chocolate, Susanna...I need it after writing my Fractured Fairy Tale...and I know you will come up with something super...you always do. :) I'm so excited to post tomorrow and link up with you! I would definitely read Beth's story...I think OCD is a topic that needs more books geared to kids...I didn't have a problem with using OCD, but I do understand the point that using a word like perfectionist might help the book appeal to kids (and parents) who are not diagnosed, but have issues with this. I would read Beth's, but it's a bit big-wordy. I find myself focussed too much to the bigger words and less on the storyline. Yeah, I'm weird like that! maybe substitute a word or two to keep my head in the game. Of course, I am probably the only one who noticed them! 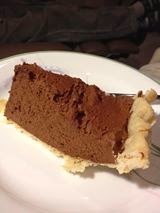 Chocolate silk pie -- yummmmm. Thanks! I would probably read the book. I find the OCD connection a compelling one, although I have a little trouble picturing a friendship between a dragon and a spider, but that's a problem on my end. I also think losing the "utter disbelief" would be an improvement. thanks Rosi - workin on it! Vivian - thanks so much for your comments! You are tooo kind! Zank you vedy much! Genevieve- thanks for your comments - - -"workin on it it - yesireeeee!" Would be happy to read the new one if you'd like!